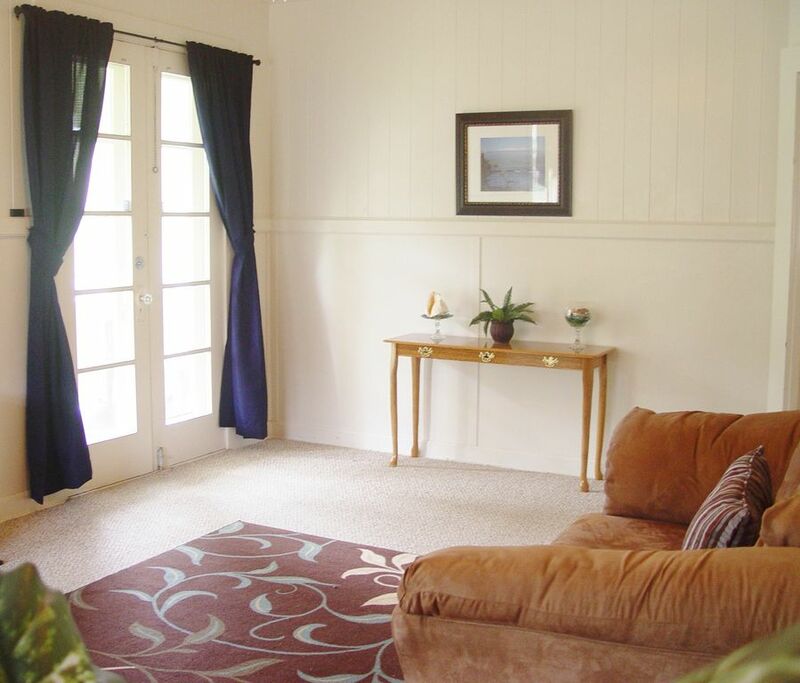 Clean and Comfortable 2 Bedroom, 1 Bath Cottage in the Heart of Hilo. Relax and make our house your home base on your next visit Hilo. Situated in a quiet residential neighborhood our two bedroom-one bath cottage features a spacious living room and lanai area to enjoy family time. A full kitchen is equip with everything you need to prepare your favorite meal or snacks for a day on the go. The bedrooms have AC, and LCD TV's for a little down time and privacy at the end of the day. WiFi runs throughout the house. Ceiling fans and standing fans are located in each room. Parking is located behind the house and where you will also find an outdoor enclosure with a washer/dryer for your convenience. This is a home and NOT a party house. Please no smoking, pets, and loud noise. The Hilo cottage is located in a community across of the airport, in the heart of an established community. It is perfect for couples, friends or families traveling with children. Our affordable nightly rate includes all taxes and a modest cleaning fee to encourage guests to spend their resources on experiences instead of accommodations. The house is supplied by county water that is clean and drinkable (no catchment systems) and located in an area with minimal Cocqui frog noise, within walking distance of restaurants, parks, and shopping. Kailua Village (Kailua-Kona) Roughly 2 hours and 30 minutes on the opposite side of the island. Thanks to our guests reviews and feedback we have installed new carpet, flooring, and base boards throughout the house, fresh paint, and new base cabinets and counters in the kitchen May 2015. For more information or to receive a quote please email or call Val (808)781-3827. We love our Leilani street plantation houses for their charm and proximity to all that Hilo has to offer. This house is absolutely wonderful!! It was extremely clean, very well-maintained and we loved the character and old school charm of the house and property. The house is located in a really nice neighborhood that's close to a lot good places - Big Island Candies, Hawaiian Style Cafe, etc. Val, the owner, is amazing and really great to work with. We highly, highly recommend Val and this property! Five+ stars all the way! Just as described, very nice. This home was not a good accommodation for 6. Two bedrooms with one double bed in each and a blowup mattress in the living room. We did get a quick response from the owner when we asked for dishes and pots for cooking and for lighting the pilot light in the oven. I was upset at the disinterest in returning my opal earring which was left on the kitchen counter. I know it was there but they refused to return it. No adequate plug-ins. None in the bathroom. I would not recommend it for more than 4 people. This house was perfect for my family. The house was clean and cozy. Our stay was very short but we enjoyed our time here and will definitely stay here on our next trip. It was clean and comfortable. We enjoyed our stay.